The American Iris Society annual convention will be held in New Orleans from April 8-13, 2018! To learn more about the convention, click here. And, the Society for Louisiana Irises will hold their annual convention immediately following the AIS convention in the same hotel, from April 12-14, 2018. Don't miss this chance to attend to great iris conventions in the wonderful city of New Orleans, LA. As a preview of what you will see during these conventions, I have assembled some pictures of some of the great places you may visit. Louisiana irises were once found growing in the canals and marshes in and near New Orleans. 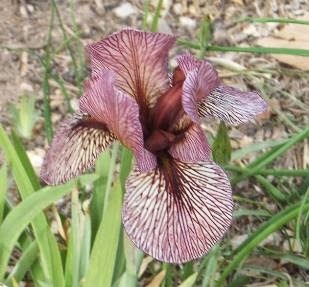 Today you can still find Louisiana irises growing in New Orleans, but you have to know where to look. One of the best places to view Louisiana irises blooming would be in City Park during the last of February and first of March. Any trip to New Orleans should include a tour of the City Park and especially the Sculpture Gardens located within the park and near the Art Museum. What better way to view the Louisiana irises blooming in the Sculpture Garden than a ride in a gondola? Another place to find Louisiana irises growing in New Orleans is at Pat O'Connor's house and gardens. Pat and his wife Julie love to collect "yard art" to highlight their Louisiana irises. To learn more about irises in general, visit the American Iris Society. To learn more about New Orleans, visit the New Orleans Official Tourist Website at New Orleans On Line. Louisiana irises grow in many places around the world. Learn to grow them yourself by visiting The Society for Louisiana Irises (SLI).To join SLI on facebook, visit Facebook - Society for Louisiana Irises. Be sure to visit City Park in the Spring to see some beautiful flowers and breathtaking landscapes. There are few irises that have stood the test of time in my garden. One of the prettiest is 'City Lights'. Although it's not a new variety (registered by Mary Dunn in 1990) it always looks fresh in the garden. It reproduces well but does not get overcrowded. It's a reblooming iris here in Southern California. One year it bloomed for 26 days, from April 1 to 25, and another year it bloomed from March 28 to May 2! I don't know if it reblooms in cooler areas, because it reblooms here late, beween September and January. Although my main garden is designed around warm colors and I have no place for blues, 'City Lights' is so lovely that it is the only iris I have planted near my pond. I must say that pictures really do not do this iris justice. That white spot makes it look like it is aglow in the garden. 'City Lights' starts out looking quite blue as the flowers first open, but it takes on more of a violet hue as the days wear on. 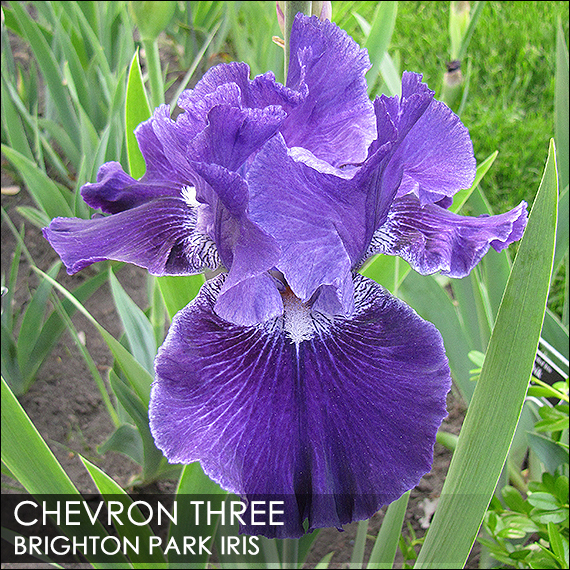 If you are looking for an iris that has a good long bloom period and lights up the garden, try 'City Lights'. I was recently contacted by an iris lover who had read my blog post on the classification of arilbred irises and wanted to sample each of the categories. She asked if I had any recommendations. I gave a few off the top of my head, and she suggested that this might make a good blog topic. I agree! So here is my arilbred sampler, for those who want to try the full range of different types of arilbreds. I've restricted the irises mentioned here to those that are readily available. 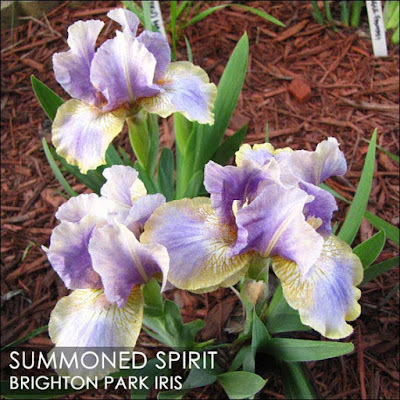 The commercial gardens that have the best selection of arilbreds are Superstition Iris Gardens, Mid-America Garden, and Blue J Iris. In addition, the Aril Society International has an annual plant sale with many more arilbreds than these commercial growers offer. The offerings vary each year depending on what members contribute, but many varieties are offered nearly every year. 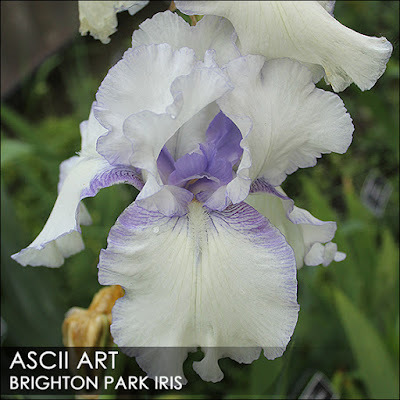 If an iris was available from one of the three large commercial growers in their most recent catalog, or in the ASI plant sales for the last two years, I deemed it readily available. 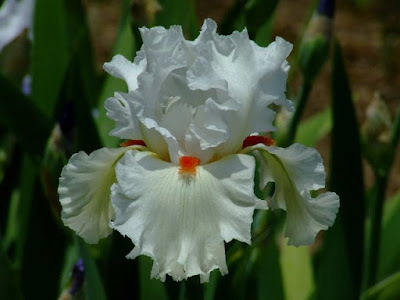 Some other commercial growers list a small number of arilbreds, and if arilbreds are grown in your area, the local iris society plant sales can also be a good source of plants. I want to be clear that this listing is indeed intended as a "sampler". The idea is to cover as many different kinds as possible, to showcase the diversity of arilbreds. It is not an attempt to identify the "best arilbreds" by some objective criteria, nor even a list of "Tom's favorites". The idea is that if you are new to arilbreds, and plant a varied assortment, you can discover your own preferences and what grows well for you. 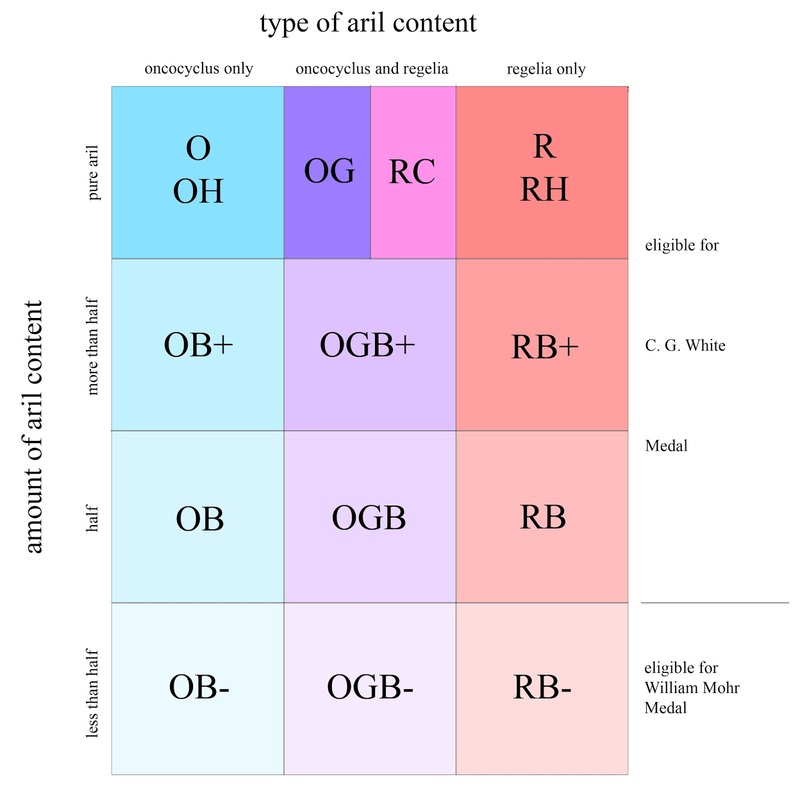 The ASI recognizes nine different categories of arilbred, based on the type and amount of aril content the iris has. There are two types of pure arils: oncocyclus and Regelia. An arilbred can have either or both of these types of aril in its background. Hence we have oncobreds (OB), Regeliabreds (RB), and oncogeliabreds (OGB, mixed onco and Regelia content). Furthermore, arilbreds can be half aril, more than half aril, or less than half aril. Those with more than half aril content are indicated with a "+" sign; those with less than half aril with a "-" sign. No sign is used for those that are half aril. Thus RB+ means an arilbred whose type of aril content is Regelia only, and whose amount of aril content is more than half. It turns out that these nine categories actually allow for more distinctions than a practical gardener need attend to. There are very few OB arilbreds, and they are indistinguishable from most OGB types. The reason is that most of today's arilbreds are descended from pioneering work by C. G. White in the 1940s, and White did not keep track of parentages during this time. So his arilbreds, although drawing heavily on oncocyclus arils and selected to resemble oncocyclus as much as possible, are classified as OGB because of the possibility of some Regelia ancestry. So I don't separate OBs from OGBs here. I do, however, separate out the arilbred medians and arilbred dwarfs from the tall arilbreds. These smaller arilbreds, typically with dwarf or median bearded irises in their parentage, fill a very different role in the garden and provide much of the diversity to be encountered in the arilbred tribe. So much for the preliminaries. Onward to the plants! These are what most of us think of when we think of arilbreds. Most are tall types, with TB and oncocyclus ancestry dominating. Blooms are typically large and globular, often with strong aril markings, such as signal spots or veining. Large bold signals are actually a rather recent development in this group, with 'Energizer' (Shockey, 1996) being a striking breakthrough in its time. More recently, 'Noble Warrior' (Tasco, 2006) combines a dramatic signal with a bit of veining. 'Refiner's Fire' (McGrath, 2007) gives a striking dark signal on a deeply colored red-toned flower. 'Sand Dancer' (Tasco, 2010) gives us a whole different look, with falls covered in peppery stippling. Yet another completely different look is to be found in 'Navajo Velvet' (McAllister, 2009), with falls of lustrous, satiny mahogany red. The historic arilbred 'Oyez' (White, 1938) has seduced many iris growers into the arilbred world with its dramatic precise veining. Strangely, it has been difficult to reproduce this striking pattern in modern arilbreds. ('Oyez' is a sterile diploid.) An early success was 'Jonnye's Magic' (Rich, 1992). For a true modern advancement in veined arilbreds, seek out 'Alakazam' (Tasco, 2013). There are few arilbred medians and arilbred dwarfs in this category. Very notable is 'Aladdin's Gem' (Thoolen, 2002), a fertile aril-pumila hybrid about the size of a small SDB (standard dwarf bearded)! Originally, these categories were dominated by tall arilbreds that came from crossing halfbreds with TBs. At a time when halbreds were uncommon and difficult to grow, the quarterbreds were the most accessible arilbreds for most gardeners. The historic iris 'Elmohr' (Loomis-Long, 1942) was a fine example of the type, the only arilbred to win the Dykes Medal. It does not show the strong aril patterning we now expect in arilbreds, without signal or veining to speak of. To understand its allure, we must think back to a time when TBs were troubled with narrow petals and often droopy form. 'Elmohr' stood out with dramatically large blooms, wide falls, and a bit of globular onco form to bring it all together. Some other tall quarterbreds for the sampler are 'Dune' (Hager, 1981) and the very recent 'Heart of Hearts' (Black, 2015). 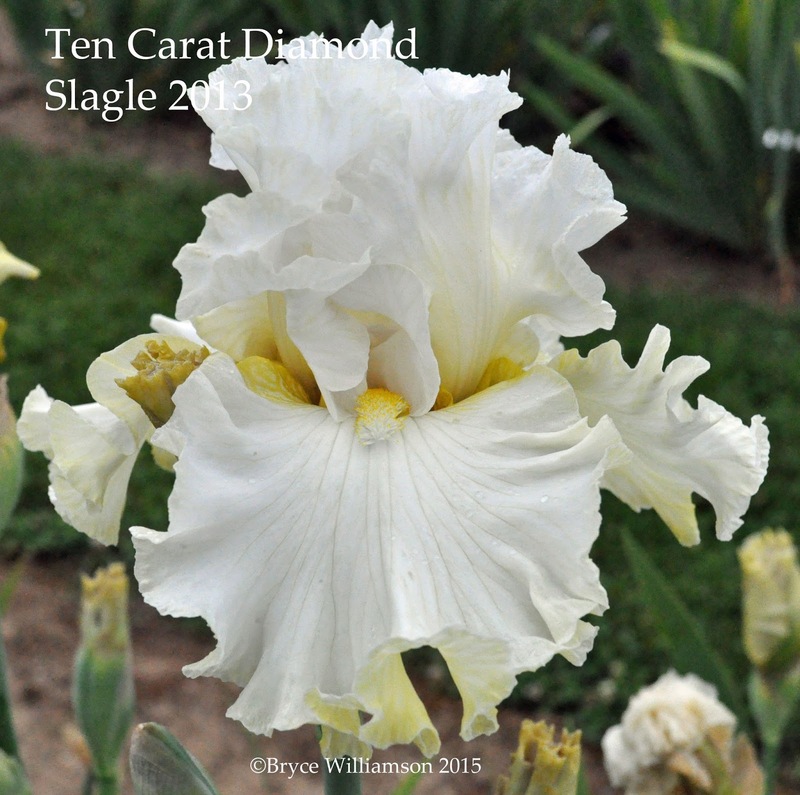 At their best, this type of iris can bring some of the modern TB form and bud count into irises that still evoke their aril ancestry. OGB halfbred with an SDB produces an OGB- arilbred median. In the garden, these occupy a niche similar to the IBs (intermediate beardeds), but with some aril traits to give them that special something extra. The charm and adaptability of this type of arilbred has given them a great appeal among arilbred growers and median fanciers alike. 'Brash and Bold' (Black, 2009) and 'Desert Snow' (Black, 2013) are fine examplars of what this category has to offer. A somewhat different approach is found in 'Persian Sapphire' (Baumunk, 2005), a child of 'Aladdin's Gem' that has more Iris pumila in its makeup than TB. There are some arilbred dwarfs in this category that are worthy of attention. 'Loudmouth' (Rich, 1970) is a perennial favorite, SDB-sized with raucous signal and veining and globular form. 'Tiny Pirate' (Rich, 1990) is the most diminutive arilbred I have grown; it would be small even among MDBs (miniature dwarf beardeds), but struts onco form, a signal, and a whisper of veining. Enthusiasm for large, globular oncocylcus irises with their dramatic signals and stippling was a driving force in early arilbred breeding. The Regelias took a back seat in the minds of many growers and breeders; sometimes they were thought of as providing nothing but some ruggedness and climate adaptability. But some have always appreciated the Regelias for their svelte elegance, sometimes striking veining, satiny texture, or blended colors. An early Regeliabred that helped draw attention to the potential of this type of iris was 'Genetic Artist' (H. Danielson, 1972). This shows a classic color pattern derived from the Regelia Iris stolonifera: a yellowish rim around a blue or violet center. 'Afrosiab' (Volfovich-Moler, 2001) shows a touch of ruffling from its TB parent, 'Mary Frances' (Gaulter, 1973). The French hybridizer Lawrence Ransom worked extensively with Regeliabreds, with his 'Eastern Blush' (Ransom, 2002) being much used in his breeding program. Ransom's work takes center stage in this category. Among the tall RB- are the horned 'Sandthorn' (Ransom, 2011), and his "Pashtun" series, for example 'Pashtun Princess' (Ransom, 2011). Ransom also produced a delightfully varied series of RB- arilbred medians, the "Vera girls", from crossing the Regelia 'Vera' (Van Tubergen, not registered) with SDBs.of which 'Vera-Marina' (Ransom, 1998) is one example. This group has become sadly scarce in commerce, with seldom any new ones registered and introduced. This is perhaps because few arilbred hybridizers today grow the oncocyclus species and hybrids needed to produce this type of arilbred, which usually comes from crossing an OGB arilbred with a pure oncocyclus. The few that are readily available are not always representative of the best this type of breeding has to offer. 'Tul Kerem' (H. Danielson, 1974) is interesting but I find its combination of oncocylcus and Regelia traits ends up not doing justice to either. 'Masada's Glory' (Whitely, 2002) is a better exemplar of what this category has to offer. Although they do not meet my availability criteria, keep a look out from 'Jeweled Veil' (Rich, 1978) or 'Dotted Sunsuit' (Mathes, 2001). These show the oncocyclus features of their ancestry to best advantage. A couple oddities round out the sampler. 'Turkish Topaz' (Austin, 1962) was registered as a pure Regelia hybrid, but its parentage is somewhat ambiguous and it looks and grows like an RB+. The flowers are yellow with much brown streaking and blotching. 'White Arts' (L. Danielson, 1986) has only Iris hoogiana in its Regelia ancestry. This species shows nothing that we might recognize as distinctively aril in its coloration. If you walked by 'White Arts' in a garden, you could be forgiven for thinking it was a white IB or perhaps an antique diploid TB. If you want to sample the world of arilbreds, be sure to try several different types. The variety available in plant size, color pattern, and form is truly remarkable! White. A color so important in the garden and so often ignored. I would shock people when giving judges’ training with the idea that the two most important colors in the iris garden were yellow and white. I stick to that position—yellow bring a shaft of sunlight into the garden and whites are need to balance other colors and patterns, bringing harmony to the landscape that might dissolve into chaos. I have yet to grow Swans In Flight. With Siberians needing moist soil, the five years of drought have taken a toll on the yard and I did not have a good place for this variety. While we have lots of water in California this year, we need a second wet season to be sure that the drought is over. In the last twenty years, two white tall bearded irises have achieved classic status. 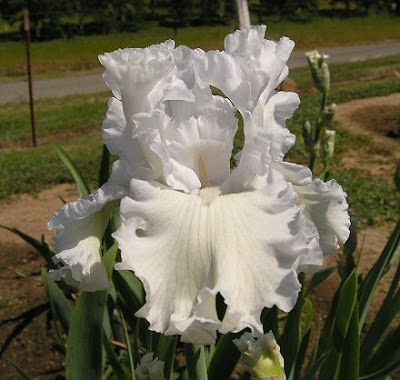 Larry Gaulter’s Carriage Trade did win an Award of Merit, but when it was first introduced, no one realized how really good it was and that it would endure while many of the irises introduced in that decade have disappeared. It is possible to note its tight branching, but that tight branching may actually be an advantage in two and three year clumps since the flowers are held close to the stalk. Still worth growing and still has a place in my iris collection. Joe Gatty’s Arctic Express has also achieved classic status. The Gatty irises were always known for their impeccable form and Arctic Express is no exception with its heavy ruffling. Ironically, it has not always performed well for me in Campbell. When Bill Maryott was still growing irises, we would often comment about an iris growing well for him 5 miles away and I would be growing something well here that he had problems with. Since Arctic Express has rave reviews around the country, it is worth adding to the garden and in the last years of the California drought, it has done better here. White with yellow-gold shoulders was always an attractive color combination, but there are few choices these days. Off the beaten path hybridizer, George Hilton, has produced Be Still My Heart. Currently there is one warm white that is very good—by warm white I mean one that is tinted with cream/yellow. That iris is Ten Carat Diamond. So far the reports on this ruffled variety are good from all areas of the country. Whites with tangerine-red beards are always popular. Vern Wood, who produced lovely irises in a small garden, released Arctic Fox and it is bright and dependable year after year. Perhaps there is a better red bearded white, but I have not seen it yet. Rick Tasco's White Hot has also be popular in the red-bearded white class, showing a touch of yellow at the hafts, and is an Award of Merit winner. New on the horizon is Schreiners Kenny G. When I first saw it in Oregon in 2015, I dismissed it as “just another white.” Then I walked into the field and saw it on a long row, looking sharp, and went back into the display garden and took a picture. 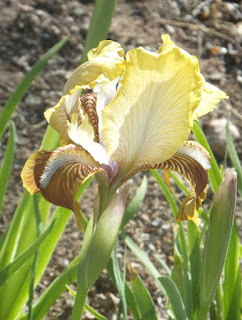 It is one of those irises I have added to the buy list. I am, of course, the only person who keeps a list of iris names by the computer of images that I have seen and think I might want to add to the plant to the garden. Hybridizing in Missouri, an area that can have difficult weather in the spring, Barbara Nicodemus has produced a series of fine irises. Her Kennadi’s Angel is overlooked. 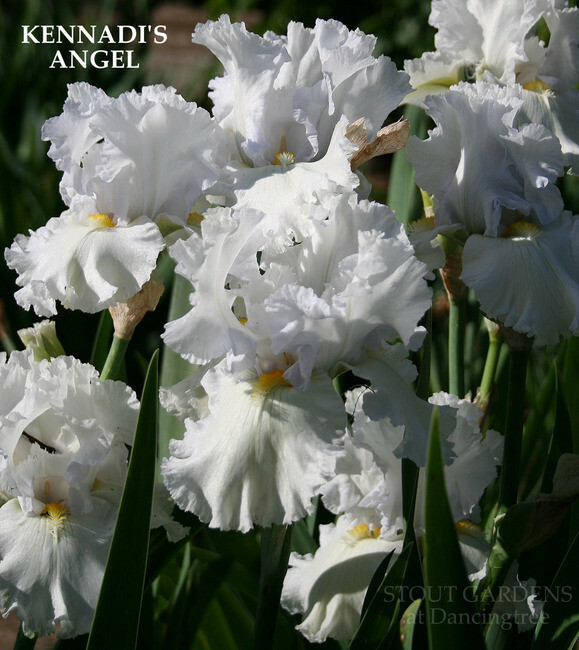 Breed from two classic irises, this ruffled white has beards than deepen to gold in the heart of the flower. In a different direction, there are the cold-blue whites. Oddly I am going to mention Silverado here. This multi award winner, grows and blooms well; the flowers have lovely form. Registered as a bluebird blue, in our California sun, it opens powder blue and fades, gracefully, to blue white after one day. Growth is good too. It should not be a surprise that one of its parents is Carriage Trade. So when planning your iris garden, remember traditional colors, including white, are important in the overall plan. 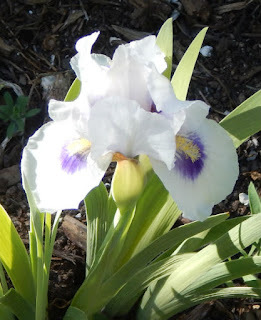 White irises bring a calmness to the yard, provide transition between color that might be garish or clashing, and will rule the flower bed with calm serenity. As mentioned previously, the Chicago iris gardener is presented with many problems: humid summers, cold winters without snow cover, and the pests such as grey squirrels, rabbits and iris borers. 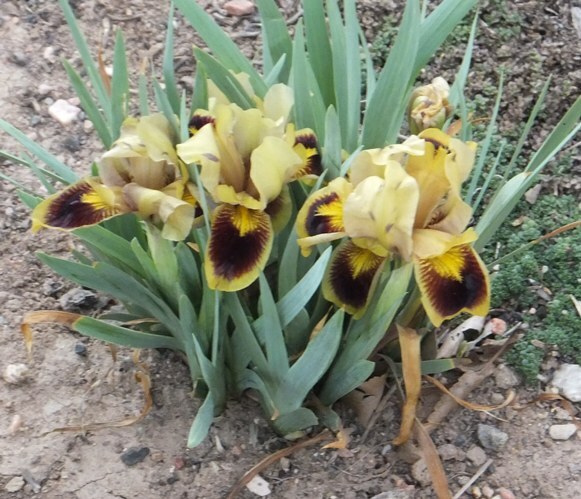 While pest can be controlled to an extent, weather cannot; and only the toughest irises survive and thrive in the Windy City. 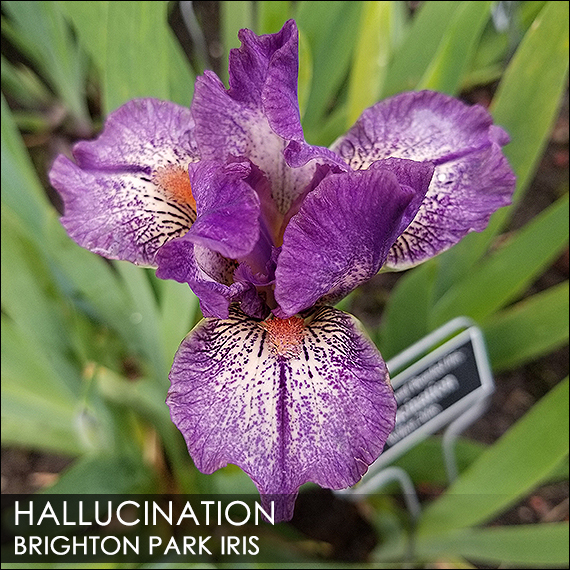 In my last blog, I provided a sampling of some West Coast iris originations that have grown well in the City of Chicago. 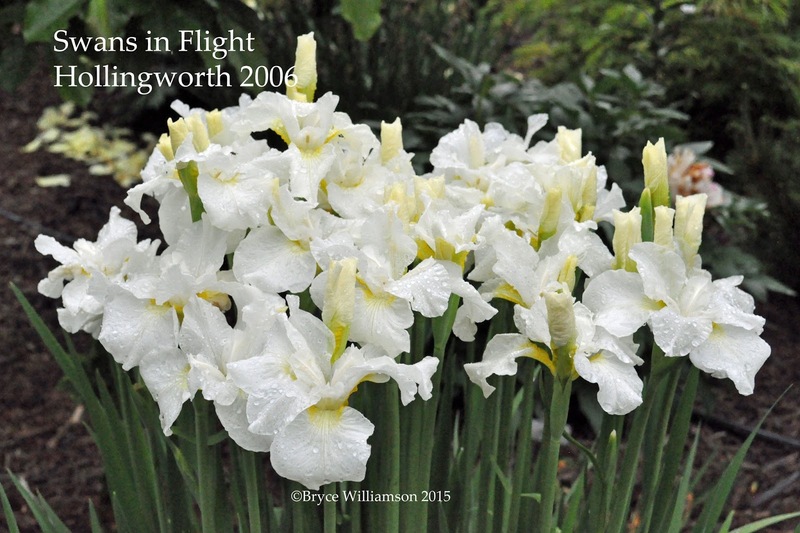 Today, I present a listing of modern irises by introduced by various iris hybridizers that have proven themselves to be superb growers. If you have some difficulties growing iris, give these a try! From Anthony and Dorothy Willott, we have Hallucination (2006). It is a remarkable standard dwarf bearded origination for its red-violet bands, veining and dotting. The carrot-red beards make a nice touch. It has proven extremely resilient and vigorous. It was attacked by squirrels in June and has made a remarkable comeback. Bijou (George Sutton, 2002) was an iris that I received as a gift from an order placed in 2007 or so. I’m am so glad that I received it. It has been nothing short of amazing and is quick to form clumps in the garden. I’m also a sucker for blue-pink irises, especially ones with blue beards! Direct from Canada, one of my personal favorites of Chuck Chapman’s introductions is his Summoned Spirit (2002). It’s an intriguing medley of pale gold and blues, almost as if each petal was individually brush stroked. The bonus of it being bred in Canada is that it is completely cold-hardy and snuffs at Chicago’s most brutal winters. Named after a computer graphic movement, Walter Moores’ ASCII Art (2007) is fine plicata. But, the fact of the matter is that it isn’t just your average plicata. 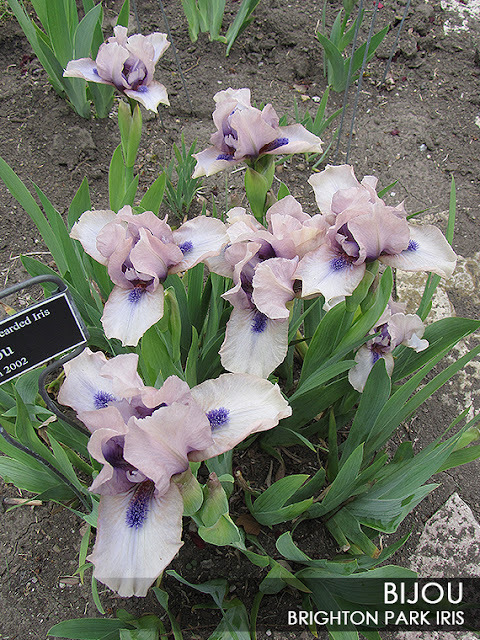 The light purple coloring is heavy strictly on the hafts and style arms of the petals. The strokes of purple are seemingly bleached away the further it encompasses the standards and falls. It has bloom consistently since planting it in 2014 and has outstanding growth qualities. A favorite iris amongst myself the Region 9 iris gardeners is Emma’s Laughter (2008) by our very own G. Steve Poole. While Mr. Poole has registered and introduced irises since the early 1980s, it is only recently that his originations are taking notice. 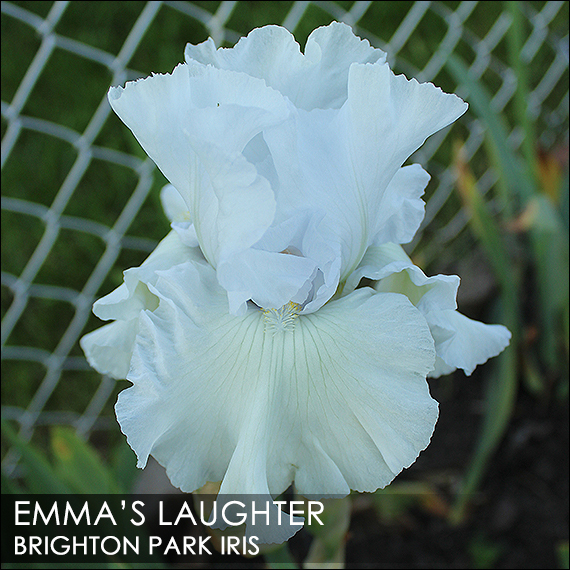 I appreciate Emma’s Laughter for its exquisite ruffling, pale powder blue coloring and crisp texture. Ernie Hoch is a new iris hybridizer based in Washington state. He only has a handful of registered introductions, but that consistently impressed me is his 2014 introduction Chevron Three. I purchased the iris as a new introduction in 2014 and it does not disappoint. As a matter of fact, it has bloomed every year so far, since planting it in 2014. Growth is just outstanding. It produced rhizomes like no other. I’ve literally had to divide it every year because there were just so many new rhizomes. Highly recommended! From overseas, the wonderful French-import Pause Douceur (2014) from fourth generation hybridizer Richard Cayeux, is proving its worth here across the Atlantic and in Chicago. A delectable confectionary, Pause Douceur has classic form, strong substance and superb growth habits. 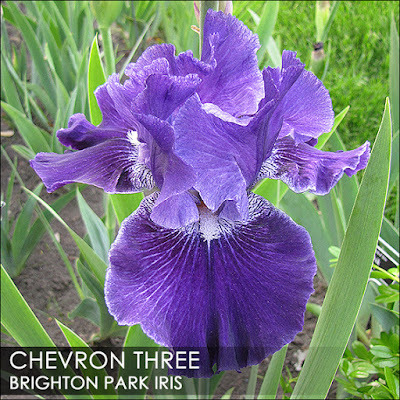 Having purchased this iris directly from the Cayeux Iris firm in 2014, I have sadly yet to see this wondrous iris for sale by any U.S. iris growers. I’m sure it will prove to be a popular iris variety in the years to come. 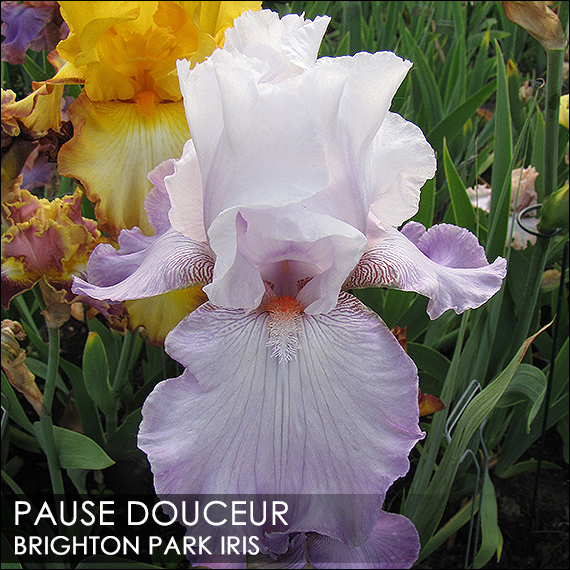 In the world of irises with ruffles galore, sometimes an iris with a more tailored appearance is a welcome reprise. 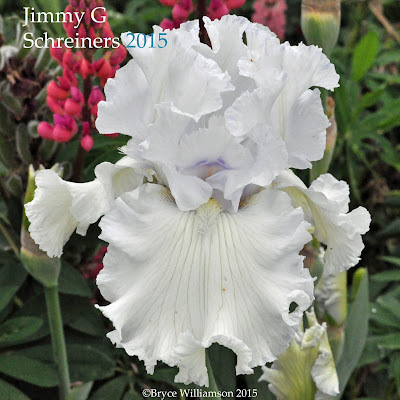 As a historic iris enthusiast and collector, some of my favorite irises are from the 1950s through 1970s. 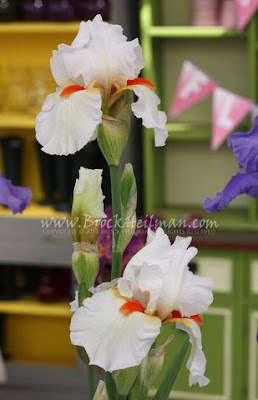 These irises were ruffled just enough to be pleasing. 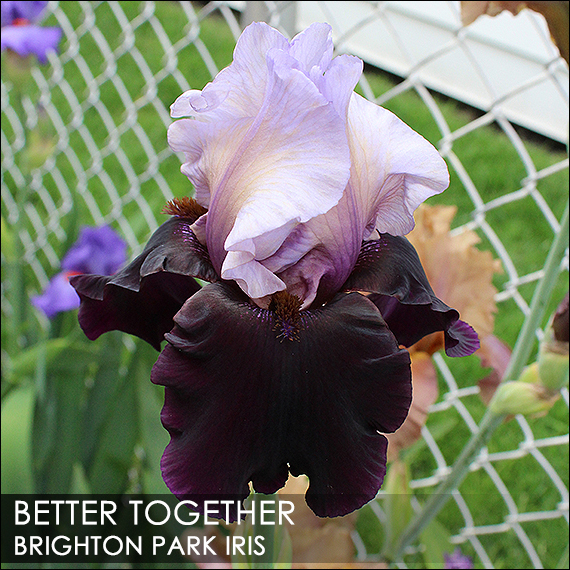 So, when I saw the Schreiner’s introduction Better Together (2014), I was very pleased so a highly contrasted iris in a tailored (to modern iris standards) bloom. To me, the most eye-catching quality is the subtle brushing of buff-cream on the pale violet-blue standards. It is very appealing, especially when offset by the much darker, wine-purple falls. So far, it has been proving itself in Chicago and it has been one of my personal favorites the recent Schreiner introductions.